IO‑Desk is a secure support platform for creative and industrial devices, including laptops, tablets, projectors, media players, hard drives and more. IO-Desk is a secure support platform for laptops and power supplies. IO-Desk features a sturdy 2 mm aluminum deck equipped with (180) 3/8-in. and (4) 5/8-in. mounting holes and corresponding device fasteners. IO-Desk includes the perforated aluminum mounting surface, (2) 5/8-in. locking fasteners, (2) 3/8-in. laptop fasteners, (2) 3/8-in. power supply fasteners, (1) IO-H and a music stand adaptor plate. IO‑Desk works with traditional 5/8 threads and includes a Triad‑Orbit IO‑H2 for quick-change operation. Once you’ve threaded the IO‑H2 into the base of the desk simply align the hex and press down. The quick-change coupler automatically locks in place. The IO‑H2 also includes a lock ring for proper alignment on non rotating stands. 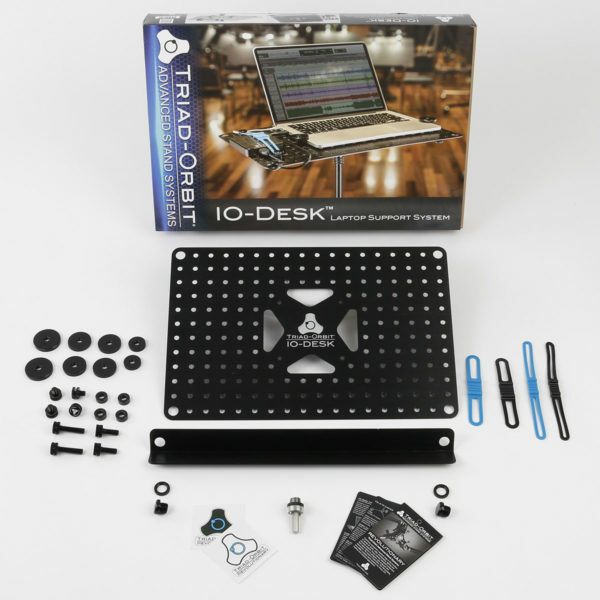 IO‑Desk system includes the following components: (1) IO‑H2 stainless steel Hex Mounting Head, (4) 3/8 in. threaded Security Studs, (4) threaded Security Fasteners, (4) threaded Strap Buttons, (4) Security Straps and (1) Security Shelf with 5/8 in. bolts and lock washers. IO‑Desk includes four threaded 3/8″ Security Studs and four silicone straps that can be used to secure your devices to the desk. Place your device as you intend to use it and position the studs to best secure the device. Place the silicone straps over the device and onto the studs with as much tension as you need.